Every year before Yom Kippur there has to be at least one article about whether a Jewish baseball player will play on the holiest day of the year. The Jewish community seems to get all excited about whether baseball players will suit up on Yom Kippur ever since 1934 when Detroit Tigers Hall of Famer Hank Greenberg chose to attend Yom Kippur prayer services at Congregation Shaarey Zedek in lieu of playing against the Boston Red Sox in a critical game in the middle of a pennant race. That year Greenberg played on Rosh Hashanah and hit two home runs that won the game, but didn't play on Yom Kippur. Sandy Koufax made it a point to never play on Yom Kippur, even sitting out a World Series game in 1965 (although he did not go to synagogue). Some Jewish ballplayers like Shawn Green have been less consistent in taking off the Jewish holy day. In 2001, Green (then with the Dodgers) sat out an important pennant race game because of Yom Kippur. That same year Green appeared in more games than any other Dodger (161 of 162 games), and had the longest consecutive-game playing streak in the majors (408 games). That streak, however, came to an end when he didn't play on Yom Kippur, a decision supported by the team. In more recent years, Shawn Green has opted to play in the night game on Erev Yom Kippur (Kol Nidrei) but not play on Yom Kippur day. "Though I didn’t grow up in a religious household, I was raised with a strong sense of identity. I was a huge baseball fan, just like lots of kids. At the time I was growing up, there really weren’t any well-known Jewish players (at least as far as I knew). I was, however, very aware of Greenberg and Koufax and the tremendous role models they were for Jewish people everywhere. "As my baseball career progressed, I always remembered the decisions that the two greatest Jewish ballplayers made, and I told myself that if I was ever in their position to, in any way, fill that role, I would. Thus, I feel a strong responsibility to make the right choices when it comes to such topics as not playing on Yom Kippur. I'm not trying to be 'the next Greenberg or Koufax,' but I am trying to do my part as a Jewish ballplayer." Even prominent rabbis like David Wolpe have tried to convince Shawn Green to sit out Yom Kippur. Some other prominent Jewish players in major league baseball like Gabe Kapler and Kevin Youkilis have also made news about their Yom Kippur playing decisions (Kapler usually plays; Youkilis sits it out). Well, this year there's a new Jewish player making news in the big leagues. Ryan ("The Hebrew Hammer") Braun (pictured at right) is on his way to becoming the first Jewish Rookie of the Year. 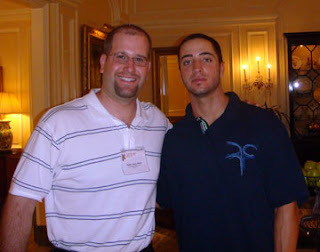 I met Ryan Braun last month when he was staying with his team at the Ritz Carlton Hotel in Phoenix, Arizona during the Milwaukee Brewers' series against the Arizona Diamondbacks. I found Ryan to be very friendly and I told him how great it is to have a Jewish athlete playing as well as he has been this year. In a very "small world" story, Ryan told me that he lived with his grandfather for a while in the same house that once belonged to Hank Greenberg. Of course with Ryan Braun making a name for himself with his All-Star season, the JTA recently raised the question of whether he will play on Yom Kippur. Braun was quoted in the Milwaukee Jewish Sentinel saying, "Being Jewish is something I take great pride in. There aren't too many Jewish athletes who have achieved success at the highest level, so it's something I'm very proud of." Hopefully, he'll make the Jewish community proud and sit this one out even though his team needs him. The Jewish community's preoccupation with Jewish baseball players and Yom Kippur is likely due to the pennant races and playoffs at the end of the regular season when Yom Kippur falls. Afterall, if the NFL Superbowl or college bowl games ever overlapped with Yom Kippur, I'm sure we'd hear about more conflicted Jewish football players!